Coming to Organ Piper Pizza for the first time? Here are some questions and answers we see regularly! Q. How does this all work? Where is your waitstaff? A. We are self-serve. Menus can be found near the main entrance, when you're ready to order come up to the register (Order Here!). When you place your order, you'll receive a number which will light up on the board when your food is ready (think Bingo!!). You can order drinks with your food - pick them up at the bar at your convenience, or skip the line and order drinks right at the bar! When you're done, leave the mess, we'll come and clear your table! A. Yes, for groups of 10 or more. Check our Group Information page for more information. Note: Certain times become extremely busy, we may be full and not able to accept your reservation. Also, at these times we may have to limit parties to a maximum of two hours. Q. When does the organ play? A. The Mighty Wurlitzer is played six days a week (every day we're open!) for your enjoyment! Feel free to request a song and make sure to write down any special events you may be celebrating! Request cards can be found near the organ console. Q. We're thinking of booking a party, do you offer any packages? A. At this time, no. Feel free to order off the menu. If you would like, we will gladly keep a tab open for your party, just by holding a credit card. A. Sure. Balloons and small table decorations are fine. Please though, no noisemakers, party horns, etc., we'll leave that to our organists! Q. Are we able to choose where we sit? A. Possibly. We cannot guarantee that you will get an exact table. On certain days and times, we have to place parties where they fit, not necessarily where they want. There are exceptions to this, please inform us if you have disabilities in your party and we will gladly accommodate you. Q. Can we bring outside food or beverage to Organ Piper Pizza? A. No. The only exception to this would be your Birthday Cake. We have a full kitchen and full bar for your dining pleasure, feel free to take a look at Our Menu! Note: if you bring your cake, we ask that you also bring your own disposable plates and silverware. ​Q. Can we hire in outside entertainment? A. No. What makes Organ Piper Pizza a one of a kind experience is our Mighty Wurlitzer and our staff of Organists who are here every day to entertain you! Q. We have food allergies in our group, can you accommodate that? A. We can certainly try! Contact Us with your exact concern. At this time we do offer a gluten-free pizza crust for those with a gluten allergy. For the enjoyment of all of our customers, there are just a few other things that we kindly ask of you! Mainly, please be courteous to others around you. We would like ALL of our guests to have an enjoyable time! Parents, we ask that you please watch your children. Unattended children can be very dangerous to themselves and others! Please keep someone at your table, Organ Piper is not responsible for missing items. Also, unattended tables may be bused! 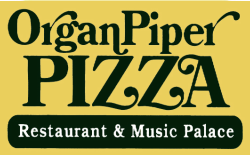 Most importantly, relax and have an enjoyable and entertaining time at Organ Piper Pizza!